The purpose of diagnostic guidelines for tuberculosis (TB) is to describe an acceptable level for all public and private professionals; they should try to achieve the proper diagnosis of patients who have, or suspected of having, or are at increased risk of developing TB. The basic principles of care for persons with, or suspected of having, TB are the same worldwide: a diagnosis should be established promptly and accurately; should use standardized treatment regimens proven, along with appropriate treatment support and supervision; response to treatment should be monitored; and the essential public health responsibilities must be carried out. The contribution of microbiology laboratory for diagnosis and management of TB is: (1) Collection of specimens for demonstration of tubercle bacilli; (2) Transport of specimens to the laboratory; (3) Digestion and decontamination of specimens; (4) Staining and microscopic examination; (5) Identification of mycobacteria directly from clinical specimens (nucleic acid amplification techniques (NAAT); (6) Cultivation of mycobacteria; (7) Identification of mycobacteria from culture; and (8) Drug susceptibility testing (DST). 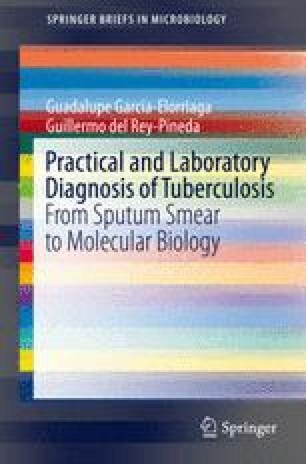 To identify Mycobacterium tuberculosis (MTB) in people without the disease, the methods used are the tuberculin skin test (TST) and the Interferon-gamma release assay (IGRA). This edition was prepared as a practical guide for microbiologists, physicians, health organizations, and educational institutions involved in the care of patients with TB. References have been included to guide the reader to texts and journal articles to obtain further detailed information on each subject.